Learn how to perform an advanced Google Analytics audit on your account and use this checklist to help you through the major issues. One of the commonly used Statsbot integrations is Google Analytics, and we would like our users to get the most out of their GA data. Therefore, we’re opening this series of articles about advanced Google Analytics. Today, we asked Georgi Georgiev, Google Analytics & Google Adwords expert, to tell us about tips and tools of intelligent GA auditing. If you are responsible for digital marketing or online UX, you know that data is your best friend. Luckily, data is abundant and nearly free for most online businesses. So making data-driven decisions is easier than ever, especially given the excellent free tools available, such as Google Analytics. This post originally appeared on Stats and Bots. Why and When to Audit? While it is true that having Google Analytics track your visitors is as easy as placing a piece of code in your site template or CMS, this is just a starting point and is rarely sufficient to satisfy the business demands. Also, larger web properties are comprised of multiple systems, making tracking deployment harder. For example, you might need to deploy to a main site, an e-commerce store, a blog, and a support system — all on separate CMS-es and sometimes even managed by different teams or departments within a larger organization. On top of that, once you have your tracking set up, you need to make sure it survives website updates, redesigns, etc. In my 10+ years as a Google Analytics specialist and as a Google Regional Trainer on AdWords & Analytics, most of the Google Analytics setups I have seen have at least one issue that negatively and significantly affected the ability to properly use the data. In many cases, the issues can be far from obvious, which is especially true when they affect just part of the setup, say, a given subset of pages on a large site. Hence, it is a good idea to have a checklist for auditing your Google Analytics setup that you can refer to anytime (we’re providing this list later in this post). You can also have a regular audit schedule, regardless of any ad-hoc audits. As with any profession, the quality of the work you deliver will be greatly enhanced and your efficiency improved if you have the right tools. Below is my list of must-have tools if you are doing audits and QA work for Google Analytics. The Chrome Tag Assistant plugin — I use this quite newbie-friendly tool to get an instant list of tags present on the page I’m working on. The functionality, which allows you to record the Google Analytics calls made while you perform actions on the page or browse between pages, is most useful. The Chrome Google Analytics Debugger plugin — It can be a bit tough on the eyes if you have no web development experience, but is otherwise super useful as it allows you to see GA work in real-time. You can see every detail for each analytics hit sent. The Chrome Developer Toolbar > Network tab — this is available to anyone by pressing F12 but is hard to use by non-developers. I use it mostly when the Analytics Debugger plugin is not available or will not work for some reason. Google Analytics itself! A lot of issues can be detected by just looking at a few key reports and metrics, especially if they concern the whole site. It is a good place to start an audit, while tools 1–3 are best for deep diagnosis. Don’t forget to use the Real-Time reports to validate changes to your tracking setup. The Google Analytics Health Status Checker— it is a tool I’ve developed in order to automate a lot of the diagnostic tasks that are a part of each audit. Since having it, it is the starting point of most of my audits. It provides the most value if you are doing multiple audits per month. Mastering the above tools will provide you with a significant edge and you will be able to detect, diagnose, and propose fixes for most issues quickly and easily. 1. Is the Google Analytics Code Up-to-Date and Present on all Pages of the Site? This is the first and most basic prerequisite for proper tracking and usually small sites do not have an issue with it. However, more complex sites with multiple underlying systems can easily have pages without a tracking code on them. For example, the marketing department may have the ability to create custom landing pages that don’t share a template with the rest of the site. Thus, the Google Analytics tracking code can be missing on these pages. In such a scenario, you will fail to track your advertising campaign traffic and you will also see sessions where those pages are listed as referrals in your source/medium report. Obviously, the above case would be quite a disaster, so how do you avoid it? Good development and IT management is key, but you can also use crawling tools like ScreamingFrog to periodically crawl the site and notify you if any pages are missing the Google Analytics tracking code. If you are using Google Tag Manager, then check for the container code, but also make sure your triggers cover all pages you want to have tracking on. Checking for a higher-than-usual percentage of self-referrals is something you can do in seconds and can be the first tip that something is off. 2. Is the Whole Site Tracked Using the Same Version of the Google Analytics Library? Google Analytics has had different libraries over the years and when they release a new library, usually it will be at least partially incompatible with older versions. The current library is analytics.js, also called Universal Analytics. The previous version that I call “Classic Analytics” is ga.js. These two libraries have completely different approaches to cookies. If you have some pages tagged with one library and other pages tracked with another, your session metrics and behavior flows will be a total mess. That’s because new sessions will be started in some scenarios when a user navigates between pages with different tracking libraries. Please note that this issue can also exist even if all your pageview tracking is fine. For example, with Google Tag Manager you could easily be firing Universal Analytics pageviews, but Classic Analytics events, leading to similar issues. 3. Are There Pages Where Double-Tracking Is Happening? The above is what you would see if you have double-tracking on all pages of your site. However, it is possible that you only have double-tracking on certain pages within your site, and your overall bounce rate will not be affected so much. To check for such instances, make sure to examine your landing pages report for pages with unnaturally low bounce rates. 4. Are You Tracking Only What You Want to Track? Even advanced users are not used to regularly checking their hostnames report, while in fact, they should. You can find this report under Audience > Technology > Network, Hostnames as the primary dimension. Oftentimes you will see traffic from developers being logged in, sometimes Google Analytics referral spam (often sent via the Measurement Protocol! ), and almost always a bit of traffic logged on googleusercontent.com. The last one is usually from the Google Translate and Google Cache services. The best practice here is to make sure you have proper view filters that include only traffic from valid hostnames. 5. Are Advertising Campaigns Tracked Properly? Whether you are doing AdWords or Bing CPC, social media ads, e-mail promotions, or traditional banner placements, you should be tracking your ad campaigns’ traffic in the most detailed way. For AdWords it’s easy — you just need to link your AdWords and Analytics accounts and you’re done. You’ll be able to differentiate between organic and paid traffic, between different campaigns and creatives, and you will even have spend data which allows you to calculate ROAS within Google Analytics. However, other traffic sources require a bit more work in order to have similar data available. You would need specially crafted URLs that contain campaign tracking parameters — utm parameters. Google provides a Campaign URL Builder tool that will help you with this task. Just don’t forget that the three parameters: source, medium, and campaign, are required. I still often see URLs where only source and medium are present. Needless to say, these don’t work as expected! In order to check if your campaigns are properly tagged, just go to Acquisition > Campaigns and check whether the campaigns listed there cover all that you expect to see. If you have the same campaign name across different channels, apply a secondary dimension of “source/medium” to be able to differentiate between them. 6. Are There Goals and Ecommerce Tracking? Do They Work Properly? It goes without saying that you should have proper goals configured for your site, covering both major goals like lead form submissions, purchases, contact requests, newsletter signups, etc, but also micro goals such as reaching a key page or adding a product to cart. For each of these, you should have funnels, as both the Funnel Visualization report and the Goal Flow report are super useful for UX/CRO improvements. E-commerce is a must for any site that processes online transactions. You should consider an Enhanced E-commerce tracking implementation if you run a large store and have a strong development team. It requires more work to integrate than most Google Analytics features. 7. Are You Tracking Internal Site Search? Internal site search tracking is super easy to set in most cases, while the value from having it properly configured can be significant, especially for e-commerce websites where searches usually consist of items the user wants to potentially purchase. Just remember that the setup is view specific, so make sure all your views are configured. This list can be expanded by checks for the presence and proper functioning of custom dimensions, content groupings, custom metrics, site speed tracking, etc. Some of these are actually situational and the way you’d go about QA-ing them will also vary depending on each particular setup. 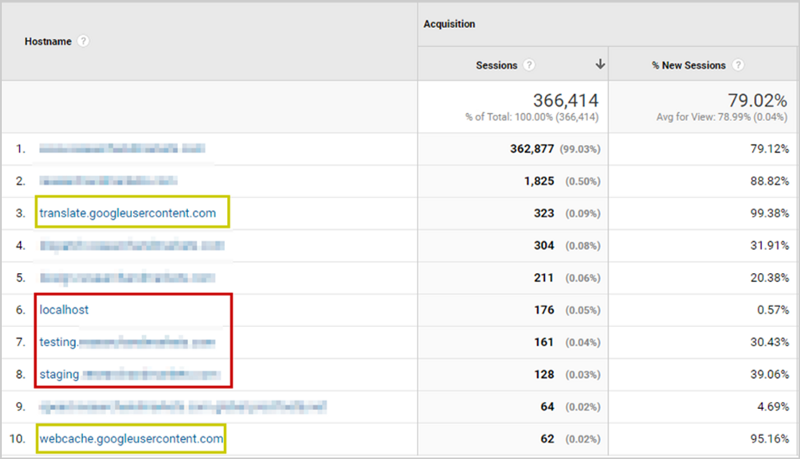 However, the top 7 I’ve listed above are really a must in any Google Analytics audit.